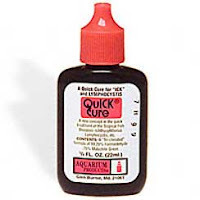 Quick Cure or Quick Kill? Quick Cure works by poisoning the less complex organisms in your tank. Plants survive only because of their cell wall, which other organisms lack, and vertebrates have complex enough metabolism to detoxify the active ingredients in Quick Cure. Any invertebrate or fungus will be wiped out. A quarantine tank will work for to keep your cray out of the toxic soup, but knowing when it's safe to return it to the tank is another matter entirely. The composition of your tank is important to consider. Do you have a clay substrate? Are the rocks in your tank hard or soft? If you have aquarium plants, do they fix compounds from the water? All of the above may absorb and then slowly leach the Quick Cure back into your water, slowly poisoning your crayfish. Another alternative would be to remove all the fish from your tank, leaving your crayfish the sole tenant of those premises. You could then add some ghost shrimp and have a crustacean-only tank. An aquarium without fish is an aquarium without problems, and all the better for your cray. Is it possible for a fresh water blue lobster to survive in a mini tank without a water pump? A heater? or both together? Is it possible for you to survive in a broom closet without circulation or heat? Or both? If you have a question about your crayfish's living conditions, reflect upon your own personal needs first. A blue lobster can survive many challenging environs when it needs to. For the purposes of petkeeping, however, maintaining an optimal environment is important for both your pincered friend and your enjoyment. Without proper heat, light, oxygen, and food your cray will suffer mentally and physically. The only time it's appropriate for a cray to live in subhuman conditions — such as what you described above — are when breeding, rearing, moving, or aspunishment. Unless your cray has misbehaved in a manner befitting isolation, don't even think of putting it in an uncirculated, unheated "mini" tank. Just remember to always ask yourself this question: What has my cray done to deserve time in the brig? Otherwise, that's where you might end up after you've been convicted of crayfish abuse or neglect.